This week, I’m focusing on the “Customize and Enhance Content Builder” unit within the “Create Compelling Content with Content Builder” module in Trailhead. Where are you so far with your trails in 2019? Do you have a Trailhead New Year’s resolution you’re pursuing? If you’ve been following along with me on the Ledgeview Partners blog, you know I’m steadily walking you through my experience within the “Create Compelling Content with Content Builder” module. When you’ve reached this unit within the module, read on and learn more with me. This unit really focuses on letting you customize and enhance your Content Builder experience after you’ve become more knowledgeable with it and understand the value of content sharing. To learn more about the aforementioned, I suggest you search the Ledgeview Partners blog using the keywords: “A Beginner’s Guide to Salesforce Trailhead”. In this unit, you learn how to administer Content Builder customizations. So, if you want to learn more about how to share content with your enterprise, configure tabs in the editor, or configure tabs for content block editor, this unit is for you. Within this unit, you learn about how to customize code within Marketing Cloud for your unique needs, creating widgets that can be hosted anywhere. Each user can tailor widgets unique to their own agendas, according to this unit. So, if you want to use widgets in your emails or web pages, you can certainly do so! Salesforce encourages that this is truly put into practice when you use Email Studio or CloudPages, which they cover in the “Content Builder Features” unit. So, if you want to learn more about that, come back next week as I share about my experience with the next unit in this module. 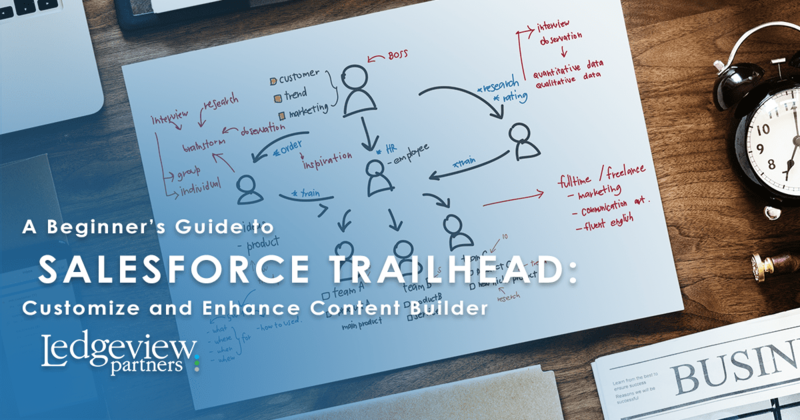 If you find yourself more advanced and want to move forward, some resources that may benefit you in the meantime include Salesforce’s own “Content Builder Administration” and “Extend Content Builder” documents within Trailhead. If this topic interests you, click here to get started at Trailhead.Salesforce.com.